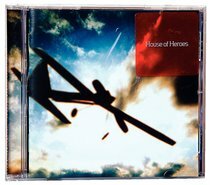 House of Heroes burst onto the scene with an awesome self-titled debut! A melodic blend of tight harmonies, impressive guitar riffs, solid drumming and deep lyrics, this is a catchy collection for all fans of indie, prog rock, and punk. House of Heroes is an alternative rock band from Columbus, Ohio. They have released five albums: What You Want Is Now (2003), House of Heroes (2005), The End Is Not the End (2008), Suburba (2010), and Cold Hard Want (2012). The band also released the album Ten Months (2001) under their original name, No Tagbacks, which had more of a punk sound than their releases as House of Heroes. They also re-released their self-titled record under the name of Say No More (2006). The band consists of Tim Skipper, Colin Rigsby, A.J. Babcock, Eric Newcomer, and Matt Lott.